Based on recent calculations, by 2030 it is estimated that artificial intelligence (AI) in China will have generated renminbi-yuan (CNY) 600 billion by cutting costs and increasing revenue, all due to advances in technology once thought impossible. In the automotive industry, AI breakthrough’s in self-driving cars will increase this number by CNY 500 billion. Healthcare is expected to save CNY 400 billion and in retail, Roland Berger estimates that AI will bring in approximately CNY 420 billion. 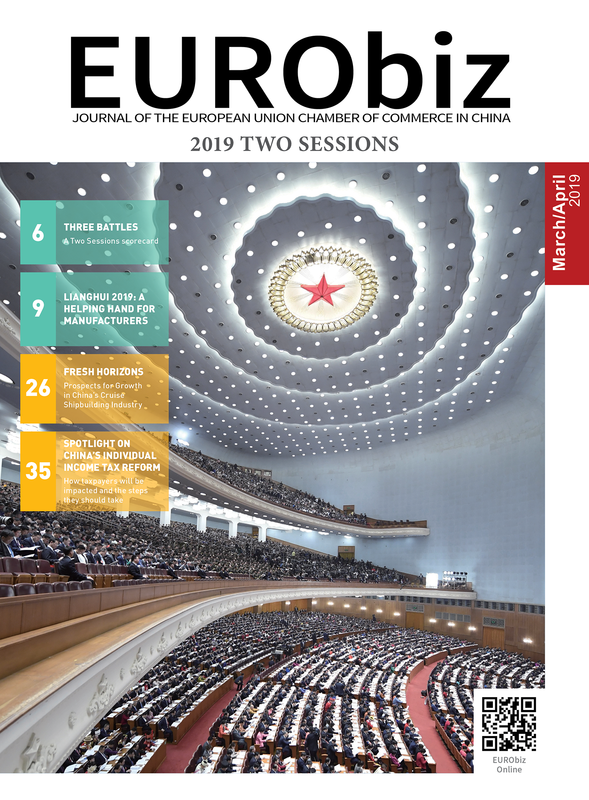 Exploring these developments, Elvie Lahournere, from Roland Berger, dives deep into China’s AI-based commercial applications. In June 2017, the Chinese Government published a new version of the Artificial Intelligence Development Plan, which pushed this industry’s domestic development to new heights. Venture Capitals warmly welcome AI. China is making substantial headway in AI industry development, due to large domestic demand and large amounts investment capital. Beijing, Shenzhen and Shanghai are among the top cities in the world where AI enterprises and talents gather. Chinese AI has also started penetrating other major industries throughout the country and having a large impact on domestic production as a whole. Recently, the AI market, along with investment, has been increasing rapidly. This all seems to point to both the marketplace and society at-large acknowledging and putting their confidence into this industry. What has led to this technology’s recent acknowledgement is the improvement in its data collection, algorithms and raw computing power. This makes it possible for AI to generate real business value. Chinese AI enterprises now lead global AI development, with the help of an immense amount of talent, a large market and strong support of venture capital. China is the second largest AI market, only surpassed by the United States (US), in terms of the number of enterprises, patents and financing. In China, approximately 50 per cent of AI companies focus on machine vision, service robots and natural language processing. As the gathering place of AI innovation, almost 80 per cent of these companies have their base of operations in Beijing, Shanghai and Shenzhen. From a quantitative perspective, by 2030 AI will have generated CNY 10 trillion in growth by helping to drive other industries forward. 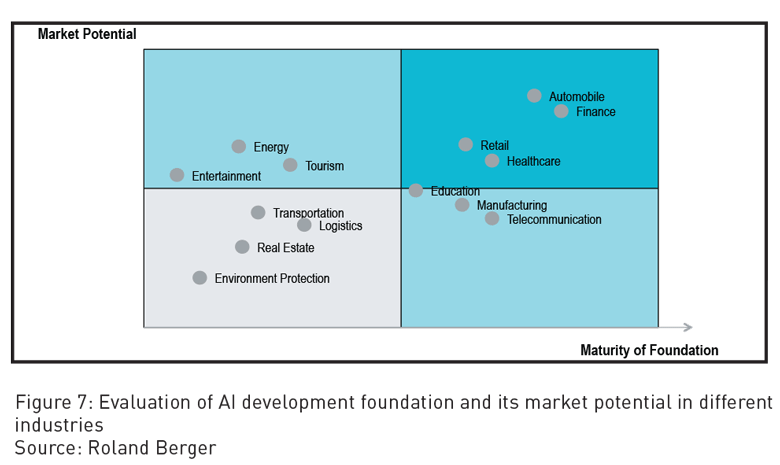 According to Roland Berger’s calculations, traditional industry sectors that will be influenced most by AI will be the finance sector, the automobile sector, the retail sector and the healthcare sector. In the financial industry, Roland Berger estimates that AI applied to risk management, asset allocation and investment consulting will reduce costs by CNY 600 billion in revenue. In automotive industry, AI application in self-driving technology will bring about CNY 500 billion RMB revenue. In healthcare, AI will increase the R&D success rate in pharmaceuticals and offer auxiliary diagnosis, as well as supplementary care, in medical institutions. In view of these improvement on service efficiency, it is estimated that in healthcare industry, AI will reduce costs by CNY 400 billion. In retail, AI applications on recommendation systems will improve online sales and at the same time reduce inventory costs by providing a more precise market forecast, which, through a combination of cutting costs and increasing revenue will lead to a CNY 420 billion surplus. We have depicted different industries in the matrix of development foundation and potential. AI is undoubtedly playing an important role in industries with a mature foundation and high market potential, such as the automobile, consumer products, retail, finance and healthcare industry. In medical cosmetology and dentistry, data containing customers’ shopping experience, age, transaction volume, and daily habits can be analysed and matched intelligently utilising artificial intelligence. Alcon pharmaceuticals uses a data acquisition tool to integrate online and offline data from new and old VIPs, and with that information they can craft 360° portraits of those individuals. This has helped Alcon increase the number of WeChat followers by 10,083 and on Weibo by 10,147. The business’s interaction with followers on social media increased by 1.4 million. The active rate of Alcon’s VIPs increased from 12 per cent to 78 per cent. The growth offline took up 39 per cent of the whole. Machine learning algorithms can help with auxiliary diagnosis. Auxiliary diagnoses that utilise AI can analyse a patient’s data and then using a large amount of background medical information, be able to recommend a diagnostic technique or prognosticate on the illness. As for precision, with the help of medical experts, AI has the ability to surpass human doctors in the fields of cardiovascular disease, cancer, neurology, and ears, nose and throat (ENT). When it comes to AI auxiliary diagnoses, IBM Watson question and answer computer system has had the most success. Within 17 seconds, IBM Watson was capable of reading 3,469 medical books, 248,000 papers, 69 therapy plans, data of 61,540 experiments and 106,000 clinical reports. The application of AI in medical imaging mainly consists of two parts. In the first part, the perception stage, machine vision is used to recognise medical images and help doctors reduce the amount of time it takes to read film, which can improve efficiency and reduce the error rate. In the second part, the learning and analysis stage, image and diagnosis data can be used to train an AI’s neural network model and equip it with a diagnostic ability. A success case in medical imaging is the AI system developed by the Beth Israel Deaconess Medical Centre (BIDMC) and Harvard Medical School. This system has been able to detect cancer cells in breast cancer images 92 per cent of the time. In cooperation with pathologists, this success rate could easily reach 99.5 per cent. 4.How can enterprises take advantage of AI? The current situation for AI is similar to the Internet in the mid-1990s. Currently, Google, Facebook, Amazon, Alibaba, Baidu, and other Internet giants are developing AI technology either by acquiring start-ups or by establishing their own labs. 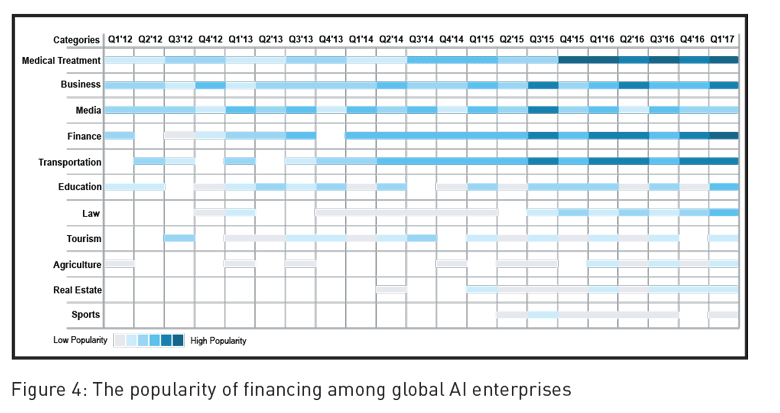 Meanwhile, leading companies from different industries are actively investing, purchasing, developing and researching various AI application scenarios. Right now, is the time to start investing and developing AI. Advice #1: Build-up particular departments or teams, eliminate barriers to acquiring resources and information between organisations and implement AI as soon as possible. Advice #2: Encourage innovation inside the company and accelerate AI development with the focus on capital operation. Advice #3: Provide long term AI training for employees. In the end, the most important advice is to start accumulating data as soon as possible. This technology will bring new possibilities to all industries. Apart from reducing costs and increasing revenue, new business patterns will also emerge. Although there is still a long way to go for AI, with the improvement of artificial narrow intelligence the influence of AI on different industries only grow with time. Only those companies that have already started to accumulate data, talent resources, the necessary software and hardware can become the future leaders in AI. At the same time, all industries should cooperate with technology companies to explore AI’s possible applications and accelerate its adoption into daily operations. As for AI technology and solution providers, they should also be commercially oriented. By keeping the focus on providing opportunities for businesses, AI can grow healthily and sustainably. This article is an excerpt from a more comprehensive Roland Berger study on AI’s application in China. Roland Berger, founded in 1967, is one of the world’s leading strategy consultancies. With 50 offices in 36 countries and over 2,400 employees, the company has had successful operations in all major international markets. The Chinese market is a key pillar of Roland Berger’s international expansion. Since our first project in China in 1983, the consultancy has grown rapidly. As the only consulting firm with European origins among the global top five, Roland Berger has built its expertise on its extensive experience working with clients on complex business cases for over 40 years. Share the post "Innovative AI Applications in China"